SA President Erika Feinman asked the senate to create more vice presidential roles during a meeting Monday night. The Student Association Senate voted Monday night in favor of adding two vice presidential positions to the SA’s executive cabinet, creating the first referendum to appear on the ballot during this month’s elections. The senate voted unanimously to amend the SA constitution to upgrade the director of diversity and inclusion and director of campus operations to vice presidential positions within the executive cabinet. The student body will need to approve the changes during SA elections later this month. 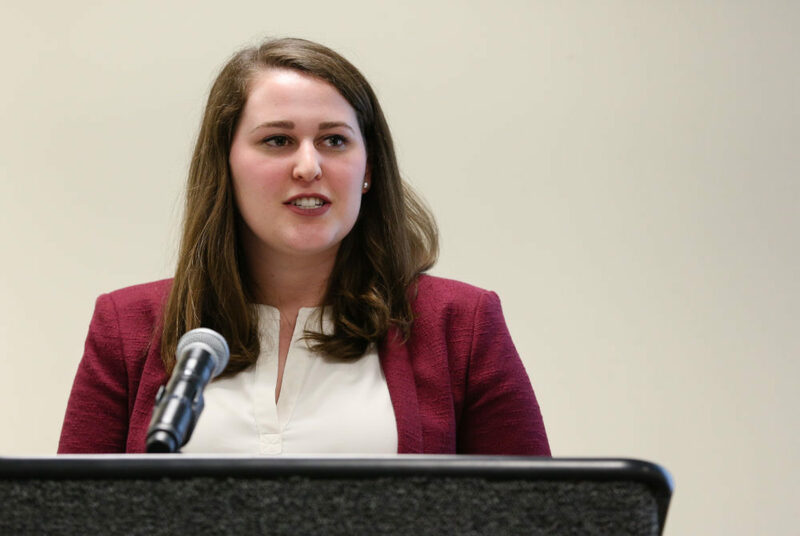 SA President Erika Feinman said the two positions should be elevated to vice presidential posts because they have taken on increasing importance in recent years and the senate should be able to approve and oversee the nominees for these roles. Feinman also initially proposed combining the vice president for community affairs and vice president for student activities into one post. At first, Feinman wanted to create one position that would have assisted and advocated on behalf of students and student organizations, while also representing GW’s students to the Foggy Bottom community. But that portion of the bill was removed after some senators expressed concerns that combining the two roles would not allow whoever filled the position to focus enough attention on all of their responsibilities. Sen. Keiko Tsuboi, ESIA-U, said because of the University’s often “contentious” relationship with the surrounding neighborhood, the SA should have a role solely focused on community affairs. “I can’t see somebody being able to make all of the different community meetings and really be an active member of that community and at the same time being able to balance the responsibility of figuring out the best ways to reach out to student organizations,” she said. The senate also voted unanimously to approve minor updates and grammatical changes to the SA’s constitution. Those updates will also be voted on by the student body during the upcoming SA elections. The senate also confirmed Ezra Alltucker as the chief of staff to Executive Vice President Thomas Falcigno.